This home is absolutely a reflection of it's owner. 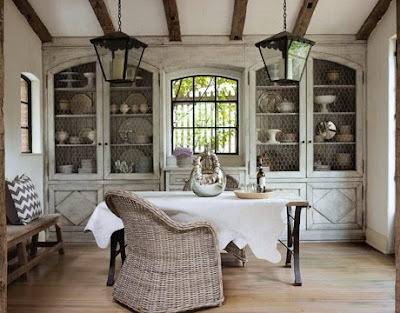 It has charm, wit and character apparent in every room. 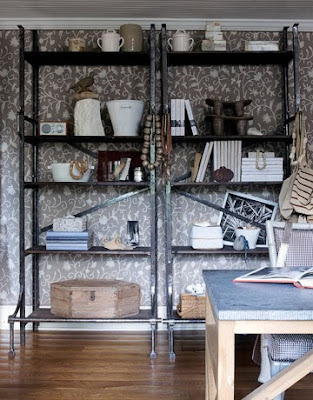 I fell for it's rustic sensibilities and industrial fittings when I first saw it on the House Beautiful site. Then and there I did a blog post this wonderful space. It was soon after I saw it gracing the December cover of HB magazine. When out of the blue one day I received an email from it's owner, who was having a blast seeing her "funny little house all over the world", I knew this was a lady I liked. When she said she would love to answer any questions as she was "very opinionated", I couldn't wait to hear her answers. So I purposely asked random questions, the kind that give you some insight into the person, not just the great designer. 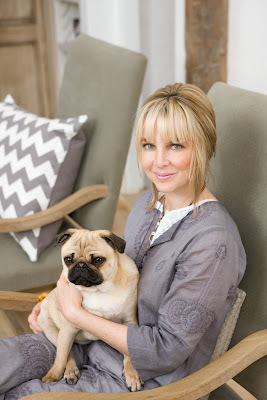 So I am thrilled to give you my Q + A with Jill Sharp Brinson. I hope you enjoy reading it as much as I did. ss.My husband and I had the opportunity to live in Columbia SC for a short time. I fell head over heels for the South. ( not just Columbia itself, but Charleston and the history and plantations, and the stories that surround the area. ) How did you end up in Atlanta? Are you originally from there? Are you a southern girl? IF ONLY ATLANTA HAD THE CHARM, SOPHISTICATION, COASTLINE AND ALLURE OF CHARLESTON - SADLY, IT DOES NOT AND WE HAVE TO CREATE OUR OWN MYSTIQUE HERE! What keeps you going to work every day? Why do you love it? You have a color scheme.. love that - I'm the same way. What happens when you fall for something that doesn't fit? I love that you make your bed the way my mom taught me when I was a little girl. Do you always make it this way? WE REALLY JUST MADE IT FOR THE PHOTO SHOOT - HALF THE TIME ALL WE DO IS PULL THE DUVET UP AND GO! Your website is lovely - did you design it? Tell me about the Hominy project! Do you have any interior pictures yet? GREY WOOL MULES FROM INDIA THAT I BUY FROM "LES INDIENNES.COM"
Most loved clothing item in your closet. Is there one thing you do every day that sets the tone for your day? what a great post and interview! so happy you asked. this is one of my all time favorite homes. Great interview! 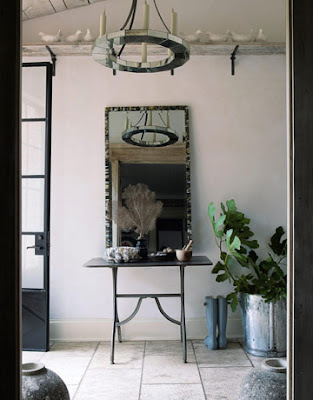 I too was sooo taken with this home --don't forget to listen to the Skirted Round Table at 'CotedeTexas' - Stephen Drucker, the editor of HB talks about the Brinson cover...I truly could not stop looking at the pictures of the home thinking how creative it is and the colors! Lucky you! awesome interview. i am so glad i am reading through your blog this morning. this house has been such a hit around the blogs and it's great to hear another side of jsb. I wonder if she would give me a Q & A on dog training. i think i just died and went to a heaven where eaved ceilings become libraries and everything has a touch of pink. wow. This is really something! Good for you, great questions. She's crazy talented, isn't she? First time I'm here and liking what I've seen so far. I'll be back! Wow, it's obvious you two really hit it off! That was a great interview... seriously great. And what a coup to interview the the cool woman behind the most talked about house in the design world. I really enjoyed it. Great job!! 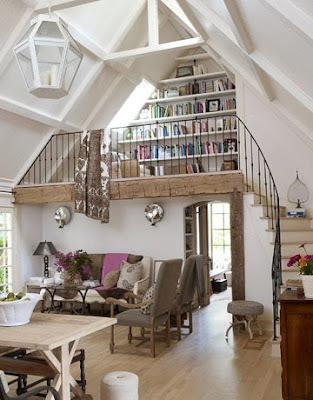 that living room w/ the book cases on the second level is to die for. i had the pleasure of meeting her last month at an event here in atlanta. such a lovely and amazingly talented woman. i thoroughly enjoyed your interview. thanks!